Due to popular demand from Australian fans and following a hugely successful concert tour of UK and Europe, the world’s greatest Dire Straits show returns to Australia and New Zealand in September 2018 to perform an incredible catalogue of hit songs. 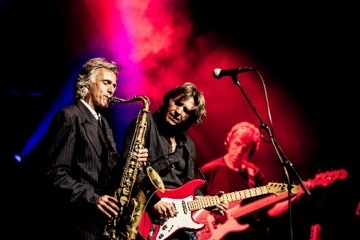 The Dire Straits Experience features original band member, Chris White, on Saxophone, supported by 6 world-class musicians who have performed in the bands of artists such as Paul McCartney, Joe Cocker, Ray Charles, David Bowie, Tina Turner, Rod Stewart, Van Morrison and David Gilmour – they are the best of the best! It has been more than 40 years since the opening line of Sultans Of Swing was first heard being broadcast around the world. In the process, it introduced us to a majestic guitar player and songwriter in Mark Knopfler, and to what has become a musical universe unto itself: the music of Dire Straits. Over 20 years have passed since Dire Straits disbanded, leaving a catalogue of some of the finest compositions and musical performances that the heyday of rock ever produced. If anything, their reputation has only grown with time. Record sales of more than one hundred and twenty million albums continue to increase as new young fans discover the music and join the band’s massive worldwide following. Whilst Mark Knopfler and the band permanently parted ways in 1995, their music has never waned in popularity and continues to be heard on radio across the world. 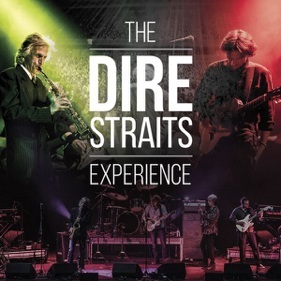 The Dire Straits Experience celebrates this musical legacy. With the breathtaking skill and showmanship of the original 120-million-selling stadium phenomenon, hear them reignite the greatest hits of Dire Straits including Money for Nothing, Walk of Life, So Far Away, Brothers in Arms, Sultans of Swing, Romeo and Juliet, Tunnel of Love, Telegraph Road, Private Investigations, Twisting By the Pool and more. Featuring a spectacular light show and state of the art sound, this promises to be the most ambitious and best DIRE STRAITS EXPERIENCE show yet. Chris White’s first real break in the music industry came in 1981 when he was asked to play on Nick Heyward’s album “North Of A Miracle”. Following this success, his reputation continued to build, playing and recording with artists such as Paul McCartney, Aztec Camera, Chris DeBurgh, The The, and Mark Knopfler, the latter leading to what he is best known for – the saxophone sound of Dire Straits. His work with Dire Straits included the “Brothers in Arms” and “On Every Street” World Tours, the “On Every Street” and “On The Night” albums, and the legendary “Live Aid” and “Mandela” concerts. More recently, Chris has also guested on two of Mark Knopfler’s solo albums. Outside of this association, he has recorded and toured with many artists, including Joe Cocker, Ray Charles, Mick Jagger, Suggs and Robbie Williams. Of English, Portuguese, Welsh, Irish and Australian descent, Terence Reis grew up on the east coast of Africa in the Portuguese capital of Lourenço Marques (now called Maputo) in Mozambique. It was here that he was first exposed to music and the guitar: the instrument of choice for the rhythmic, finger picking street musicians. This sound, mixing with the European rock ‘n’ roll radio stations of his youth, began a journey of musical inquiry that has taken in Blues, Folk, Rock, African, Celtic, Americana and an ungodly mix of roots music. After completing an honours degree at the University of Witwatersrand School of Dramatic Arts, Terence embarked on an award-winning career as a professional freelance actor and voice artist. At this time that he was also developing his life-long love of music into a parallel career as a guitarist, singer and songwriter. It has seen him playing, writing, singing for and fronting various bands. However, it was a decision to take a sabbatical that led to a move to Canterbury in the southeast of England. It was here that he formed the band Waterhorse. A decision that would introduce him to The Straits and ultimately The Dire Straits Experience. Tim Walters began playing the guitar in 1989 and has steadily built a reputation as one of the most exciting guitarists in the UK, known for his versatility and powerful live playing. With a wide experience of live performance, he has shared a stage with some of the UK’s finest Rock, Pop and Jazz musicians and comes to The Dire Straits Experience through his work with Chris White on other projects. Tim is also a respected teacher who lectures at the world renowned “Academy of Contemporary Music” (ACM) in Guildford and has also organised many music courses, work shops and master classes. The diverse range of players he has worked with over the years include: Matt Holland (Trumpet: Van Morrison, Ray Charles), Gaz Coombes (Supergrass), Albert Lee (Guitar: Eric Clapton, Emmylou Harris), Alec Dankworth (Bass: Van Morrison), Guthrie Govan (Guitar: Steven Wilson, The Aristocrats), Steve White (Drums: Paul Weller, The Who), Laurence Cottle (Bass: Eric Clapton, Gary Moore), Irwin Sparkes (The Hoosiers), Chuck Sabo (Drums: Elton John) and many more. Tim uses Vigier Guitars, Victory Amplifiers and Rotosound Strings. A keyboard player and musical director of great accomplishment, Simon Carter has worked with a huge array of artists in the world of pop, rock and jazz. He played with Jamiroquai between 1999 and 2002, which saw him tour the world many times over in promotion of the Synkronised and A Funk Odyssey albums. This was followed in 2003 with another major world tour with Craig David. He has also worked with artists as varied as Nik Kershaw, Elkie Brooks, 10cc, Leo Sayer, The Divine Comedy, Anastacia, Rick Astley, Kim Wilde and Midge Ure. A graduate of The National Youth Jazz Orchestra, Simon toured extensively with Ronny Jordan, a major instigator of the Acid Jazz movement, and has also played with a host of American contemporary smooth jazz artists when they have visited Europe. His versatility is highlighted by stints as Assistant Musical Director of West End Shows: Five Guys Named Moe, Smokey Joe’s Café, and the Tony award winning RENT. Simon is also a respected educator in pop music performance, which includes teaching posts at BIMM London and Kingston University. Since graduating from the Royal Academy of Music some 30 years ago, John has been a professional musician with a skill set ranging from pianist, keyboard player, musical director to composer, arranger and programmer. He has performed all over the world in all kinds of venues from concert halls, arenas, TV studios, London West End Theatres to jazz clubs, dance halls and even living rooms. He has worked with many artists from the Rock and Pop world both as a keyboard player and musical director. Kylie Minogue, Jason Donovan, Nik Kershaw, Howard Jones to name just a few of the ever-growing list. He was Rick Astley’s MD for many years culminating in Rick’s come-back album ’50’ which toured in 2016. In the last year alone, John’s varied appearances include playing for the BBC Concert Orchestra, playing for the BBC Strictly Band on Live TV and touring with shows such as Brendan Cole’s (BBC Strictly Dancer) All Night Long and the Forty Years of Disco tour with original artists such as Rose Royce, Sister Sledge and Tavares. His music programming skills in recording, sequencing and music notation have also been put to full use in his studio where he has worked on numerous projects for international publishers and artists. He also has a strong link with musical instrument manufactures such as Roland and Yamaha both at a promotional and R&D level. Paul Geary is responsible for laying down the low frequencies of Nik Kershaw’s band. In 1993, he was voted Best “New Musician” by the British Music Association and has since established himself as one of the UK’s foremost studio bassists and active session musician. Paul started his playing career comparatively late, having had no formal music training. He started playing bass in a gospel church at the age of 18 and shortly after this he went on to study music in the US and is now an Honours Graduate of Berklee College of Music in Boston USA, and B.I.T, Musicians Institute of Technology in Los Angeles, California. He received his first break in 1991, working with soul diva Lisa Stansfield and Gabrielle. He went on to work with Chris Rea and played alongside Jools Holland as part of the Prince’s Trust Rock School. Later, in the autumn of 1993, he started playing bass for Chris Norman, the former lead singer of Smokie. 1994 brought relocation to London to head up to the Academy of Contemporary Music’s bass school. Paul still found time in his busy schedule of full time courses at the Academy to lecture live performance workshops and he is also a contributor and columnist for Bass Guitar Magazine. Three years later, in 1997, Paul recorded a new studio album and went on tour with Nik Kershaw. A second album with Kershaw followed two years later. Since then, the years have been busy touring and working as a music director and session musician with artists such as Lisa Stansfield, Gabrielle, George Michael, Simply Red, Chris Rea, A1, Nik Kershaw, Donny and Marie Osmond, The Lighthouse Family, Liberty X, Chris Norman, Geri Halliwell, Dane Bowers, Sophie Ellis Bexter, Clarksville, Enrique, Phix, Dside, Blazing Squad, Rachel Stevens, Mary J. Blige, Westlife and – since 2015 – The Dire Straits Experience. Currently splitting his time between working with many of the above-mentioned artists and lecturing, Paul remains in demand as a bass player, music director and educator. Andrew began playing drums in 1990 at the age of thirteen. Interestingly, the music of Dire Straits played a large part in his early education as he started out playing along to their records on a drum kit he made out of cardboard boxes. After studying music, Andrew began his professional career by touring extensively in the UK and internationally. This included regular festivals appearances such as Hyde Park, Sonnisphere, V-Festival, the Isle of Wight Festival, Bestival, as well as opening Glastonbury on the Pyramid Stage. In addition to touring and recording with other artists, Andrew remains associated with the Royal Academy of Music with whom he has worked for the past 17 years. In 1991, Andrew was in the crowd for Dire Straits’ On Every Street world tour concerts and at their Woburn Abbey show in 1992. Twenty-five years later his path crossed with the Dire Straits Experience and he was asked to join the line-up of musicians where he is now loving the opportunity to play live, the songs he knows so well. He has not been required to use his cardboard box drum kit.